The bones that are most commonly involved are vertebrae, sternum, pelvic bones, ribs, and femurs. Metastatic prostate cancer cells tend to make the bones around them thicker and denser, whereas other osteolytic metastatic cancers, such as breast cancer, lung cancer, and renal cancer, tend to break down and remove the bones around them. This indicates that there is increased bone turnover. Actually, both osteoblastic and osteoclastic activities increase, but the relative amount of osteoblastic activity exceeds that of the osteoclasts, and bone formation is the net result. The actual mechanism by which metastatic cancer cells elicit osteoblastic reactions is not known yet. However, it is believed that there are reciprocal cellular interactions between prostate cancer cells and bone stroma that result in proliferation of both prostate cancer and bone stromal cells. Overall, the pathologic fracture rate from prostate cancer is relatively low compared to that of other metastatic cancers, because of the bone forming reaction by the tumor. However, in the end, the bone metastasis can lead to bone pain, inflammation, and increased risk for fractures. Also, vertebral tumors may compress the spinal cord and cause nerve damage. It is important to get a good feel for the level of bone involvement, because it has a significant impact on overall patient survival. Niche competition and cancer metastasis to bone. The prostate cancer bone marrow niche: more than just ‘fertile soil’. Prostate cancer cells and bone stromal cells mutually interact with each other through bone morphogenetic protein-mediated signals. Osteolytic and osteoblastic bone metastases: two extremes of the same spectrum? 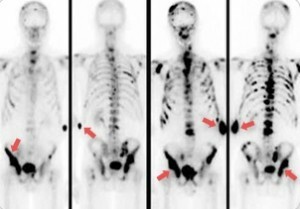 Prostate cancer bone metastases promote both osteolytic and osteoblastic activity. Cadherins (named for “calcium-dependent adhesion”) are a major class membrane proteins with prominent roles in calcium-dependent cell adhesion and regulation of tissue organisation and morphogenesis. Cadherin-11, also known as osteoblast-cadherin, is a member of a superfamily mainly expressed in osteoblasts but not in epithelial cells. Normal prostate epithelial cells do not express cadherin-11. However, prostate cancer cells with bone metastasis propensity express high levels of cadherin-11 and reduced levels of E-cadherin. It has been reported that prostate cancer cells undergo a switch from expressing epithelial E-cadherin to mesenchymal cadherin-11. Cadherin-11 plays an important role in both normal tissue development and in cancer cell migration. Study shows that cadherin-11 promotes prostate cancer cell motility and invasiveness that may facilitate the metastatic colonization of prostate cancer cells in bone. Androgen deprivation therapy (ADT) is generally the initial treatment for men with metastatic prostate cancer. Study shows that ADT up-regulates cadherin-11 expression in prostate cancer, and this may contribute metastasis of prostate cancer to bone. Thus, cadherin-11 is considered a hormonally regulated cellular marker and one of many factors involved in the bone homing of prostate cancer cells. Cadherin-11 is also considered a therapeutic target. Cadherin-11 promotes the metastasis of prostate cancer cells to bone. Cadherin-11 increases migration and invasion of prostate cancer cells and enhances their interaction with osteoblasts. Cadherin switching in human prostate cancer progression. Androgen depletion up-regulates cadherin-11 expression in prostate cancer. Inhibition of Cell Adhesion by an Anti-cadherin 11 Antibody Prevents Bone Metastasis. GSK-3 (glycogen synthase kinase) is a multifunctional serine/threonine kinase that is active all the time in all cells, but particularly highly in many types of tumor, including prostate cancer. GSK-3 is presently known to be a key regulator of a wide range of cellular functions. GSK-3 regulates numerous cellular processes through a number of signaling pathways important for cell proliferation, stem cell renewal, apoptosis and development. Phosphorylation of a protein by GSK-3 usually inhibits the activity of its downstream target. Thus, signals that inhibit GSK-3 often cause activation of its diverse array of target proteins. Regulation of GSK-3 is important for normal development, regulation of metabolism, neuronal growth and differentiation and modulation of cell death. Cadherin-11 is regulated by GSK-3 inhibition. Further, treatment with GSK-3 inhibitors greatly reduces both the basal level and density-dependent increase in cadherin-11 expression. GSK-3 inhibition utilizes several mechanisms to regulate cadherin-11 expression. GSK-3 inhibitors also reduce prostate tumor cell growth through different mechanisms. Therefore, inhibition of GSK-3 could be an interesting new strategy for the treatment of metastatic prostate cancer. ProstaZym contains GSK-3 inhibitor, and the combined synergistic use of GSK-3 inhibitor, HDAC inhibitor, mTOR inhibitor and proteasome inhibitor exert powerful anti-tumor activity and could have a profound effect on the promotion of cancer cell death. ProstaZym can shrink, or even completely cure, all human tumors, including metastatic prostate cancer, breast cancer, lung cancer and kidney cancer. Post-transcriptional regulation of cadherin-11 expression by GSK-3 and beta-catenin in prostate and breast cancer cells. Distinct expression and activity of GSK-3α and GSK-3β in prostate cancer. Inhibition of glycogen synthase kinase-3β counteracts ligand-independent activity of the androgen receptor in castration resistant prostate cancer.